It’s week 40. I’m having technical difficulties with WordPress today, so I’m not sure how far I will get. We’ve just recently returned to Southwest Florida. There are signs of Irma everywhere. Blue tarps, stacks and piles of trees and branches and other debris by the sides of nearly every street. The big multiplex movie theater still hasn’t reopened due to hurricane damage. Our neighbors who remained here all summer have told us of sandbagging lanais, about the fallen magnolia trees (only a few remain out of scores across the lake), now just stumps, and the six foot piles of debris including the contents of refrigerators and freezers, thanks to the electricity being off for more than four days. They’ve told us the smell of all that garbage and debris was extremely disgusting. Many people are still awaiting insurance money, if they were lucky enough to have insurance coverage, and if they have it, it’s hard to find available skilled people to do the work. Because of all this, we feel extremely fortunate to find our home intact, dry and undamaged. Well, it wasn’t exactly undamaged. The AC wasn’t working, nor were our cable, internet and phone. When I went to do a load of laundry, I found out half the laundry room wiring was fried. Thankfully, good people came and helped us, and all these problems have been resolved. The food in our refrigerator and freezer were discarded by the man who watches our place and got it ready for Irma’s arrival. So between repairs and replenishing our staples, hundred of dollars have flown from our wallets, and that’s life. People have urged us to notify our insurance company of all these expenses, but I doubt they’ll exceed our deductible. And all we need to do to keep this all in perspective is remember what our American brothers and sisters are suffering in Puerto Rico and the Virgin Islands. Millions remain without adequate food, water, shelter, and power. These are my diversions carefully curated for you this week, despite being on the road and staying in pet-friendly hotels, and coming home to big problems. 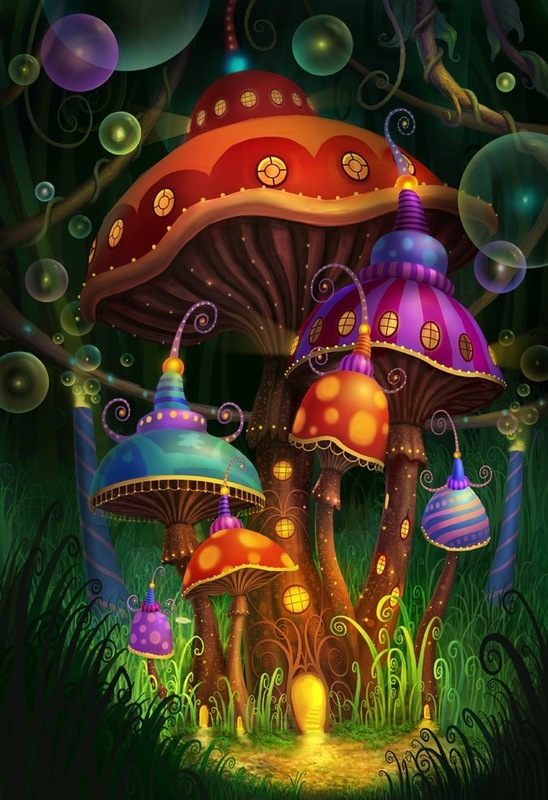 Magic mushrooms, specifically the psilocybin they contain, are helping people suffering from severe depression that has been resistant to all conventional treatments. And more than that, it appears that this chemical actually helps “reset” the brain. Wow! It’s been a great time here for the birds. The floodwaters washed fish into areas where they wouldn’t ordinarily be found, such as retention ponds and catchment basins, and when the waters receded, the fish remained. Right up the street from us, where the woods meet the sidewalk, is just such a place. This small, squarish retention pond is lined with rocks, and surrounded by tall pines, squat palms and shrubs. And high in the trees roost a large flock of wood storks, huge birds with wingspans of about 5 feet and long down-curving beaks with which they fish. It’s estimated that there are fewer than 6,000 wood storks are left in the US, as fishing areas such as ours diminish and are replaced by development. 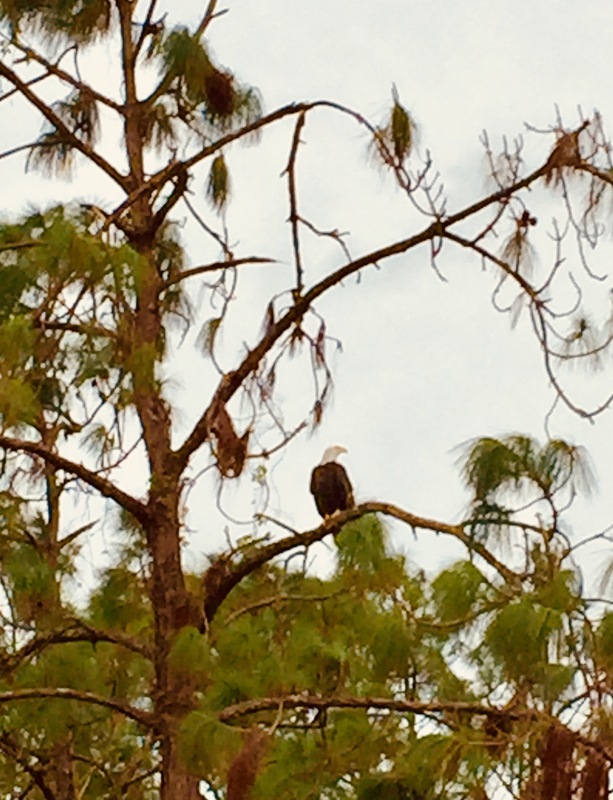 So we feel very lucky to have up to 30 of these majestic birds perching on our roof, flying overhead, and roosting in the trees. I took these photos today while we were taking a walk around the lake. The first photo is of a bald eagle that a noisy flock of great egrets drove from our lake when he attempted to fish there. He was far more beautiful than my iPhone photo shows. 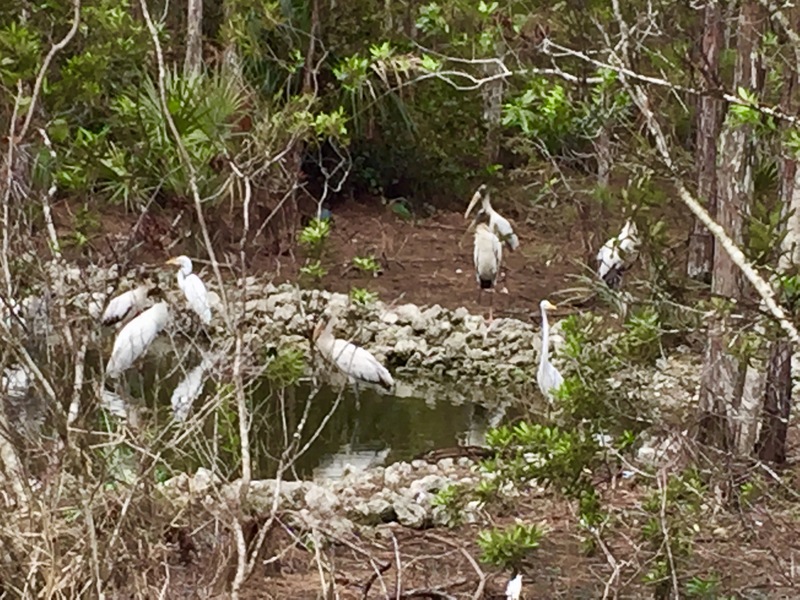 The second photo shows the woodsy retention pond surrounded by great egrets, the white birds with yellow beaks, and wood storks. Both species stand about four feet tall. The feeding frenzy marked by all the croaks and clacks gives new meaning to shooting fish in a barrel. Currently in Tokyo an unusual exhibit is drawing a lot of attention at night. 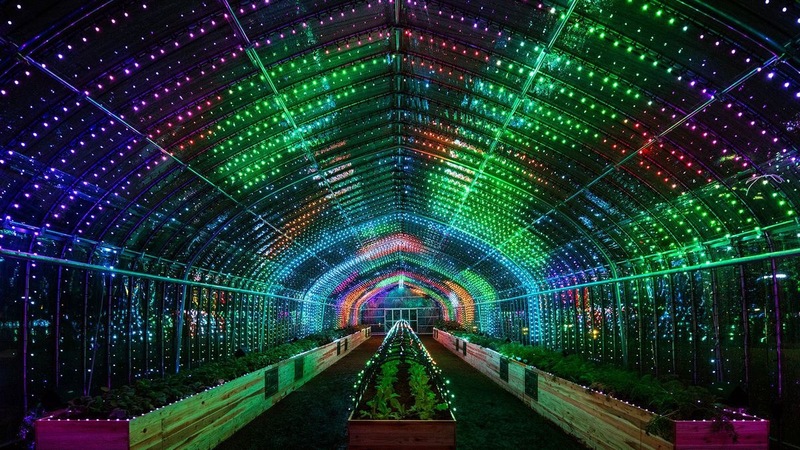 Mostly an ordinary greenhouse by day, this one plays music and gives a colorful light display when the plants are gently touched. Each vegetable plays a different note. Together the sound is amazing. Check it out! Last night when I first wrote this post and published it I was too tired to add a musical number, but this morning it came to me that “Turn, Turn, Turn” by the Byrds would be just the thing. To every thing there is a season, and a time to every purpose under heaven. Glad you made it safely to your winter home. And happy that the damage wasn’t severe. Thank you so much, Sandy! 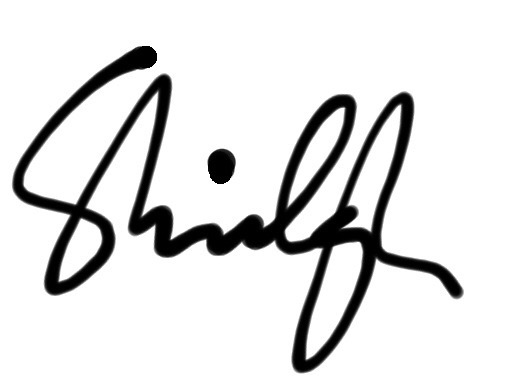 I’ve updated the blog this morning after my ability to edit seems restored. I’m somehow signed out of WP. A great mystery! WP has a mind of its own, sometimes! Thanks so much, Xenia. I missed this comment until today, a week late! I’m glad I captured the birds on digital film because I believe they’ve moved on since the fish were depleted. & beauty of this season, Sunny! The song “Turn, Turn, Turn” by the Byrds applies to so much of life. Also, WP is not that simple, as I’m retaking it once again.